The annual Wales HR Awards has become a diary marker for Welsh businesses over recent years, recognising and celebrating the hard work and commitment carried out by in-house teams, consultants and the HR industry as a whole. Created by leading recruitment specialists Acorn and commercial law firm Darwin Gray, the Wales HR Awards is the annual flagship event of the Wales HR Network; the country’s leading networking platform for HR professionals. Kelly Mordecai of Tai Tarian won 2018’s HR Star award. 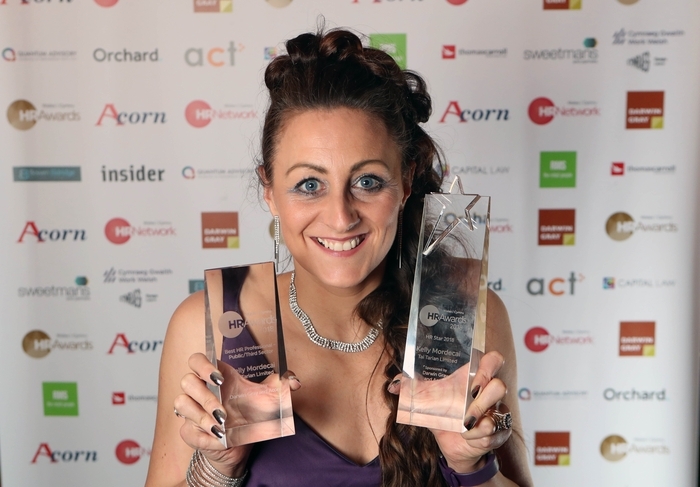 Kelly was chosen by the judges as ‘the winner of winners’ for her outstanding contribution to HR. When asked about what the award meant to Kelly, she said: “HR Star has given me a raised profile externally and I have had a few invitations to step into the public speaking arena to tell my story and share the successes we have had… This has been a great opportunity not only for me personally but also for the organisation to share and celebrate its success. It is free to enter the awards and it is possible to enter more than one category and to either nominate or self-nominate. The entry deadline is Friday 7 December 2018. Finalists will be announced at the end of January and will be offered 1 complimentary place each to the awards dinner on 22 March.